Henry Neemeyer, the oldest son of Fredrick and Helena Neemeyer was born at Westerstede Province, Oldenburg, Germany on July 6, 1868. Soon after his birth, his God-fearing parents brought him to Holy Baptism. He received his elementary education in the village of his birth and came to America with his parents in 1881, settling on a farm north of Columbus, Nebraska. Here he attended the Lutheran parochial school and was confirmed by Rev. H. Fischer on May 7, 1882. On Oct. 5, 1894, he entered into marriage with Caroline Johannes, the Rev Holm of St. John Lutheran performing the ceremony. This union was blessed with 8 children, of which, one daughter, Emma, age 7 and a son, Arthur, age 19 preceded the parents into eternity. The deceased and family came to Nance County in 1908 and settled on a farm in the Timber Creek Township. He was a faithful member of Peace Lutheran Church. He held the office of deacon for 20 years and always showed a deep interest in the growth, advancement and improvement of Peace Lutheran. On March 26, 1944, his beloved wife Caroline was called home and he made his home with his son, Otto and family. About 2 years ago, the deceased was critically ill, but rallied again and almost 2 years were added to his span of life. On Sept. 4, this fall, he received Holy Communion at his beloved Peace Lutheran Church. On Thursday, Oct. 13, 1949, he became very ill and passed away Friday at 12:30 p.m. He Mourned by his six children: Mrs. Ida Sunderman, Mrs. Anna Belitz, Mrs. Frieda Suhr, Elmer Neemeyer of Omaha, Otto Neemeyer, Mrs. Louis Hellbusch of Scribner, by a brother, Wm. Neemeyer of Columbus; two sisters, Mrs. Carl Hellbusch of Platte Center and Mrs. August Fittje of Plate Center; 15 grandchildren and 6 great grandchildren. His age was 81 years, 3 months and 8 days. May he rest in peace. The funeral services were conducted by Rev. O. H. Zeilinger at Peace Lutheran Church on Monday Oct. 17 at 2 p.m. and committal was made in Peace Lutheran Cemetery. Caroline Johannes was born in Oldenburg, Germany on October 5, 1874. In early infancy, she was baptized into the name of the Triune God. At the age of two, her mother was taken from her by death. In May, 1881, she, with her father, two brothers and one sister, came to America and settled north of Columbus, Nebraska. On June 2, 1889, she was confirmed in the Lutheran Church. On Oct. 5, 1894, she was united in marriage with Henry Neemeyer. To this union, eight children were born. Two, Emma and Arthur having preceded their mother in death. In the spring of 1908, she, with her husband and children came to Nance County, Timber Creek Township, to reside on a farm. Here she lived until the time of her death. Mrs. Neemeyer was a faithful wife, never complaining. She was a loving mother. She was a faithful member of Peace Lutheran Ladies Aid and Peace Lutheran Church. She possessed a quiet and unassuming manner, yet always made her presence felt. Death came to her quickly and quietly on Sunday evening, March 26, 1944. She attained the age of 69 years, 5 months and 21 days. Had she lived until October 5, 1944, she and her husband would have celebrated their golden wedding anniversary. She is survived by her husband, four daughters, Mrs. Ida Sunderman, Mrs. Anna Belitz, Mrs. Frieda Suhr, and Mrs. Hilda Hellbusch, all of Belgrade, two sons, Otto of Belgrade and Elmer of Papillion, and one sister, Gesine Becker of Columbus, 13 grandchildren, 2 great grandchildren and a host of relatives and friends. Services were held Wednesday afternoon, March 29, at 2 o'clock at Peace Lutheran Church, Belgrade, with the Rev. J. G. Brinkman in charge of the services. Mrs. Anna Margarite Wilke, 73, resident of Platte county 56 years, died at 7:30 a.m. today at Lutheran Good Samaritan hospital, her death being due to heart disease and complications arising from old age. In failing health the past several years, Mrs. Wilke was brought to the hospital Monday for a thorough examination, but her condition gradually became worse, and she passed away suddenly this morning. A daughter of Mr. and Mrs. Frederick Neemeyer of Westerstede, Germany, she was born there on Aug. 31, 1864. As a girl of 17, she came to the United States, traveling directly to Platte county. She was married to John H. Wilke in Christ Lutheran church, northeast of Columbus, Jan. 27, 1882. The young couple established their home 13 miles northeast of Columbus, where Mrs. Wilke resided until her death. A devout member of Christ Lutheran church, she was also an active member of the Ladies Aid society. Most of her time throughout her life was devoted to her home and large family. Mr. Wilke passed away June 11, 1932. 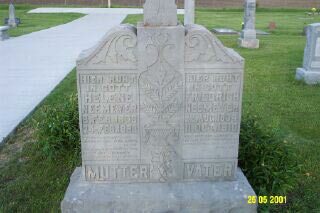 Mrs. Wilke is survived by three brothers, Henry Neemeyer of Belgrade, and George and William Neemeyer, north of Columbus, and four sisters, Mrs. Carl Mueller of Platte Center, Mrs. Carl Hellbusch of Columbus, Mrs. Fred Brunken of Hallem, and Mrs. August Fittje of Creston. She is also survived by four sons, Emil and Gottlieb of Columbus, John of Leigh and Rudolph of Richland, and four daughters, Mrs. Emil Groteluschen and Mrs. Emil Wurdeman of Leigh, Miss Mathilde of Richland, and Miss Irene of Lincoln. One son, Adolf, died in infancy. She has 36 grandchildren and one great-grandchild. The body will be taken to the home, 13 miles northeast of Columbus, Friday afternoon. Services will be held at 2 p.m. Saturday, at the home, and at 2:30 at Christ Lutheran church, with Rev. H.L. Borneman officiating. Burial will be made in the cemetery near the church.